How to Prepare For Your Summer Marquee Wedding. It’s that time of the year, where the sun is out and us Aussies are ready for 3 months of amazing sunshine, food, laughter, and get-togethers. What better time to host a wedding? Summer Weddings are becoming more and more popular with young couples at the moment, and we completely understand why! If you are someone who has a Summer Marquee Wedding planned, then this article is for you. Here are some tips on how you can best prepare for your big day, courtesy of our team at Marquee Monkeys! What Style Are You Going For? It is essential to know what style of wedding you are going for before you get go ahead and plan anything else. Our marquees are highly customisable and we can plan our designs around your theme of choice. Think about the reception style you desire as this will affect the type of marquee that you will be hiring– traditional, frame or giant tipis, for example. Also think about where you will be hosting your Wedding, and what kind of marquees will be suitable for that location. Often times, Summer can be unpredictable. This is why you will need to ensure that precautions are taken prior to guests arriving. Will you need to install misting fans to keep your guests cool? Will you need to provide guests with insect repellent to keep the bugs away? Another very important consideration is to ensure that you have clean, user-friendly and mobile toilets available for all your guests to use. Is There Access Available To All? Always remember that certain suppliers will deliver their goods to your location in larger vehicles, so think about the access that is available to them at your venue. One of the mistakes people often make is to only measure the width of vehicles without considering the swing needed – especially so when it comes to mobile toilets and power generators. If access areas are narrow, ensure that your suppliers know the relevant time slots in which they can deliver and explain any access difficulties to them way in advance. When it comes to hot weather, refreshments are so absolutely crucial. You will want to ensure that there are enough drinks available for all your guests, and this includes non-alcoholic beverages. Alcohol tends to dehydrate, especially so when people are frolicking under the hot weather. Have an adequate supply of fresh water, juices and other drinks that will keep people hydrated and not leave them thirsty. The best thing about having a marquee at any event is that you are given an instant ceiling where you will be able to hang up decorations, lighting and anything else your heart desires. Couples who desire a more intimate feeling to their marquee could also consider draping. When done well, draping will reduce the ceiling height and create dramatic entrances into different areas of the marquee. 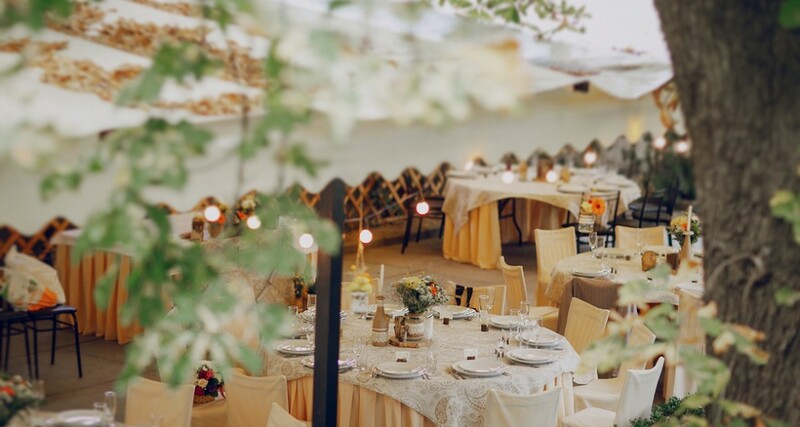 Whether you want practical lighting or simply lighting that will enhance the mood of your magical Summer wedding, always ask your marquee company what lighting specialists the recommend. Don’t forget to keep pathways lit up at night, especially in areas such as exits and car parks. You can even use tea lights on your tables to create a more intimate atmosphere for your guests. It all depends on the style you are going for! There you have it, some of the best tips we can offer when preparing for your Summer Marquee Wedding. Do you have any questions about what else you should do to prepare yourself for the big day? Don’t hesitate to call us at 1300 934 414 today! Our marquees are ideal for private functions such as 18th or 21st birthday parties but are also suitable for weddings, fetes, corporate use and any large event you are organizing. © 2019 Marquee Monkeys Party Hire.